The WD series detects water to prevent costly damage. Unlike float systems, it utilizes solid state detection, so is not prone to mechanical failure. The WD-1 is designed for mounting on the floor, drip pans or condensate pans, as the gold plated sensing electrodes face downwards out the back of the enclosure. 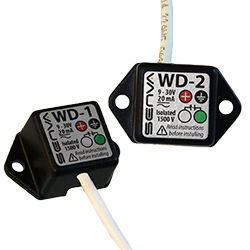 The WD-2 housing accomodates mounting to a wall or vertical surface, with the gold plated sensing electrodes angled to the bottom of the enclosure. Power Supply 9-30VAC/DC, 20mA Max. Output Rating 30VAC/DC, 0.1A (100mA) Max.